"There's too much light in the world" said no Northern hemisphere-based food blogger ever. Until yours truly found herself stranded at home, sick and unable to sleep. So, I tried to entertain myself with books. Until I realized I only own cookery books that all seem to weigh a hundred kilos each. So, looked into The Boy Next Door's library and tried my luck with short history of Samurai. Though what's short about 320 pages?! Borderline comatose I found myself parked in front of the TV, shopping channels and all o f those Big Questions That Really Matter In Life. Such as whether us never having felt the need to cut our shoes in two is down to the fact that we don't own the perfect set of Japanese knives ideal for just that (only available through shopping channel and, coincidentally, is right now on offer with a massive discount but for a limited time only so get your while you still can?) or whether we somehow wear our shoes all wrong (in one piece and on our feet)? Obviously I also felt very excited about the chance to replace all our kitchen appliances with one apparatus the size of a tea mug, which, with all its special parts and extra components would only take up twice the space our current ones do. At this point of my marathon what I really wanted though was what ever the hosts were on: even with the fever I was running the glow in my eyes was nowhere near as manic. Start by marinating the chickpeas. Combine the ingredients for the marinade and pour over the chickpeas. This can be done already the day before. 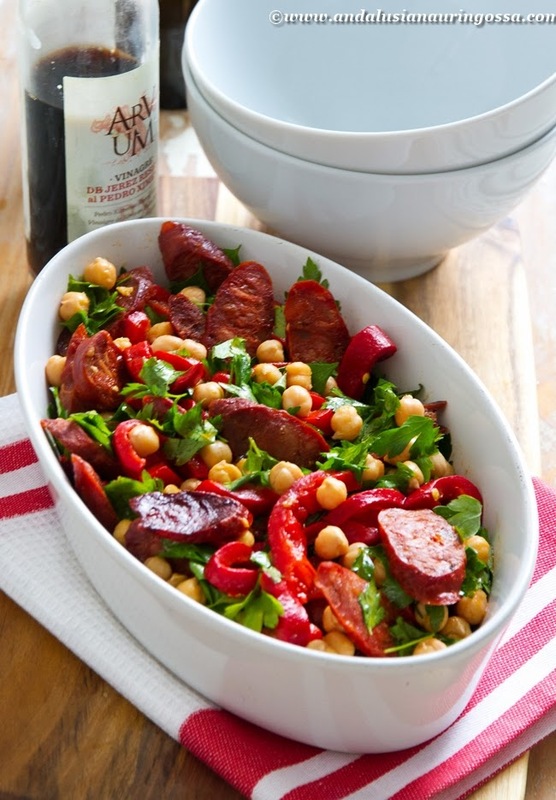 Cut chorizo to 1 cm slices and on a hot pan (no oil needed!) fry until crispy and golden. Lift out of the pan using a slotted spoon onto the serving dish. Toss in sliced roasted peppers, parsley and chickpeas. Check taste, season as needed and drizzle some lemon juice on top. Serve. Good both warm and cool so makes a good picnic dish too...!